Join, Have Fun and Win our Halloween Design Contest! Upload and publish your scary, nightmarish and most horrifying t-shirt, hoodie, tank top, or any other designs by October 12th for your chance at $500. Second Best Design in the Halloween Design Contest will get $250. Third Best Design in the Halloween Design Contest will get $50. All 3 Halloween winning designs will be featured on Customon social channels and on Customon Blog. Halloween Design Contest on Customon: How do I Participate? All entries MUST follow these rules in order to be counted. The submitting stage of Halloween Design Contest kicks off – NOW! A huge thank you for participating and best of luck to ALL of you! We cannot wait to see all the creepy Halloween designs you will come up with! Keep reading to learn all about the Halloween Design Contest RULES. Halloween Design Contest on Customon starts on October 5th, 2017 and ends on October 12th, 2017 11.59 p.m. EST. Entries submitted and published after this period will not be considered. All eligible entries received during the Submission Period between October 5th and October 12th must be UPLOADED and PUBLISHED on Customon Marketplace, with the hashtag #HalloweenDesign. Even Shop Owners on Customon need to submit and publish their designs on Customon Marketplace in order to be eligible to participate in the Halloween Design Contest. We urge you not to use the names of horror characters, movies, shows, or any copyrighted images. Entries that do not meet these requirements will not be considered. UPLOAD or CREATE in our easy artwork management panel an ORIGINAL DESIGN within the Halloween theme. PUBLISH your Halloween Design and use the hashtag #HalloweenContest by October 12th 2017, 11.59 p.m. EST. 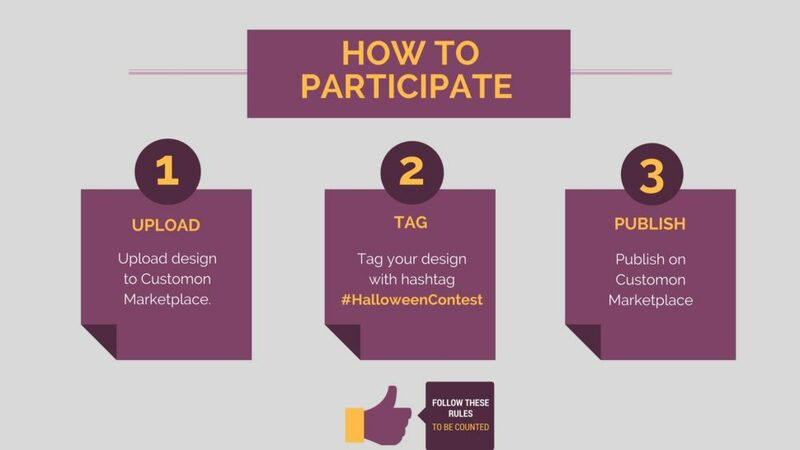 You are free to use any other hashtag to better describe your design but only #HalloweenContest hashtag will make your design eligible for participating. The hashtag #HalloweenContest distinguishes contest entries from other, non-participating entries on Customon Marketplace. Make sure to publish your Halloween Design until October 12th 2017 23.59 p.m. EST because no further entries will be considered. You can submit ONLY ONE Halloween Design marked with #HalloweenContest hashtag. Participants may not enter using multiple e-mail addresses or as multiple identities. Any entrant who attempts to enter with multiple e-mail addresses or under multiple identities, or uses any other device to enter multiple times will be disqualified. Top three designs will be chosen and determined from October 13th 2017 through October 15th 2017. Grand-Prize Winner, Second Best Design and Third Best Design will be announced on Customon website and Facebook Page during the week October 16 – 22. A Grand-Prize Winner, second best design and third best design will be selected by Customon Team. The selection process will be based on CREATIVITY and ORIGINALITY of the submitted designs. All contestants must have a valid e-mail address. In the event of a dispute regarding the identity of the person submitting an online entry, entries will be declared made by the authorized account holder of the e-mail address submitted at the time of entry. Authorized account holder is the natural person who is assigned to an e-mail address by an online service provider Internet Access provider, or other organization (e.g., business, educational institution, etc.) responsible for assigning e-mail addresses for the domain associated with the submitted e-mail address. You don’t have to purchase anything in order to enter or win the Halloween Contest. Also, no purchase will improve your chances of winning. The winning designs will be selected by Customon Team based solely on CREATIVITY and ORIGINALITY of the submitted designs. No alternative bonus, cash equivalent, or other substitution is permitted except by Customon in the event of bonus unavailability. Bonuses are nontransferable. No assignment, substitution, or transfer of bonus is permitted except by Customon, for a bonus of equal or greater value, in the event the bonus is unavailable. All federal, state and/or local taxes are the sole responsibility of the Winners. Taxes (if any) and other expenses not specified here are exclusively Winner’s responsibility. This includes but is not limited to expenses, transportation other than that directly stated, changes and transfers made by the Winner. Bonus will be awarded if we receive a sufficient number of entries. Potential winners will be determined during the period October 13th 2017 through October 15th 2017. Grand-Prize Winner, Second Best, and Third Best Design will receive the allotted prize within 10 days of proclamation. An announcement that a contestant will be receiving a prize will be sent to the email address supplied. Each contestant is responsible for monitoring his or her email account for notification or other communications related to the Halloween Design Contest. If a potential prize winner cannot be reached by Customon within 72 hours using the contact information provided, that potential prize winner shall forfeit the prize. I this case, an alternate Winner from the remaining eligible entries will be selected. If any payment correspondence, including e-mail, is returned as non-deliverable, the bonus may be forfeited and an alternate winner will be selected. No more than the advertised bonus will be awarded. Entries generated by a script or other automated means will be disqualified. Entrants must provide all the information requested in order to be eligible to win the Halloween Design Contest. Eligible entrants/contestants must submit their entry in accordance with Customon Halloween Design Contest Rules. No other form of entry will be accepted. Customon’s decision not to enforce a specific provision of these Halloween Design Contest Rules does not constitute a waiver of that provision or of the Halloween Design Contest Rules generally. Customon bears no responsibility for lost, interrupted or unavailable server, network, or any other connections, failde phone, miscommunications, failed computer hardware or software, telephone transmissions or technical failures, ISP/network/website accessibility or availability, garbled or jumbled transmissions, injury or damage to any participant’s or to any other person’s computer related to or resulting from participating in Halloween Design Contest or downloading materials from or use of the website, and/or other errors of any kind, whether human, mechanical or electronic, including, without limitation, the incorrect or inaccurate capture of online entry information. Time, for all intents and purposes of the contest, will be kept based on EST time zone, the time zone of Customon headquarters location. By entering and/or participating in the contest, entries/contestants/participants agree to indemnify and hold Customon and its affiliates, subsidiaries, advertising and promotion agencies and the agents and employees of each harmless from any and all liability, damages or causes of action (however named or described) with respect to or arising out of the contest and the use of bonus awarded. Entering and/or participating in the Halloween Design Contest constitutes permission to use winner’s name and/or likeness and address for the purpose of advertising, publicity and promotion without further compensation except where prohibited by law. Customon reserves the right to terminate or suspend Halloween Design Contest without notice if, in Customon’s sole discretion, the contest becomes infected or corrupted in any way; in such event, Customon will select winners from all eligible entries received prior to and/or after the action taken by Customon. Any attempt by an entrant/contestant/participant to deliberately damage the Customon website or undermine the legitimate operation of the Halloween Design Contest is in violation of criminal and civil laws. If such an attempt is made, Customon reserves the right to seek remedies and damages from any such entrant/contestant/participant to the fullest extent permitted by law, including criminal prosecution. Customon may prosecute any fraudulent activities to the full extent of the law. Failure of Customon to comply with any provision of these Halloween Design Contest Rules due to an act of God, act of domestic terrorism, war, earthquake, fire, hurricane, riot, terrorism act of public enemies, actions of governmental authorities outside of the control of either (excepting compliance with applicable codes and regulations) or other force majeure event will not be considered a breach of these Halloween Design Contest Rules. Participation in the contest constitutes entrant’s/participant’s/contestant’s understanding of and full and unconditional agreement to and acceptance of these Halloween Design Contest Rules. Customon reserves the right to disqualify any entrant/participant/contestant that they determine to be in violation of any term contained in these Halloween Design Contest Rules. 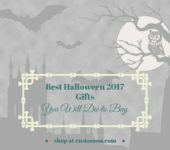 Customon has sole discretion for how to resolve any Halloween Design Contest-related issue that is not mentioned in these Halloween Design Contest Rules. Any course of action for an issue falling under this clause will be duly communicated to those who are involved. For updates and reminders throughout the contest, follow us on our Facebook page and here, on our blog.